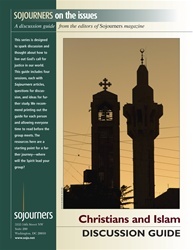 "... users through a study of the important stories of shared history, theological similarities and differences, and aspirations for social justice that both Christians and Muslims share as communities of faith. Religious differences provide fertile ground for animosity and misunderstanding. Yet as Christians, we are called to work for truth and reconciliation. Over the years, both Muslims and Christians have dealt with extremists who distort the character of true belief. Significant, intelligent dialogue and the development of authentic friendships across religious lines are key to deepening our mutual faith." If you see a generic Amazon.com ad here, or to see a new selection of books, click on your browser's refresh key.